SQL-Ledger is a browser-based application. Anybody familiar with internet browsing should feel at home using sql-ledger. 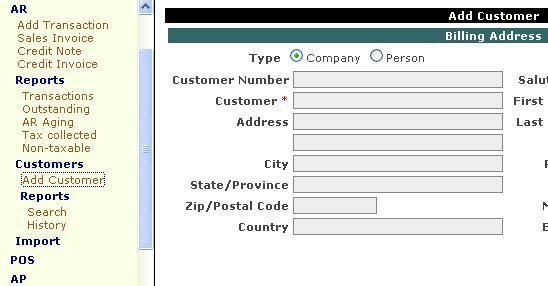 All Sql-Ledger user-interface elements (menu, forms, reports) are displayed using standard HTML. You can use any modern browser to run the application. Firefox is recommended. Sql-ledger menu is displayed in left frame. Menu items can be collapsed into sub menus or individual menu items by clicking them. Lookup information (customer/vendor address) and calculations (invoices subtotals etc) are not automatically updated on a form after a change. You need to click the Update button to do these. Update button does not store anything into database. It just looks up appropriate missing information, does any pending calculations, and adds one more line on multi-line forms like invoices and orders. It is safe to click Update button as many times as you like. You can also trigger update action by pressing ‘Enter’ key in any text field. You can add a new transaction (order, invoice etc.) or a master record (part, customer, vendor etc.) directly through the module menu. 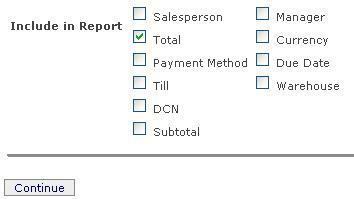 To change or delete a transaction or master record, you use the Reports menu option in the sub menu. Once you display the report by clicking the Continue button, you can use the hyper links on report to change or delete the record. For example to add a new sale invoice, you click AR–Sale Invoice. To change or delete an existing invoice, you click AR–Reports–Transactions. A selection form is displayed where you can specify date range and include/exclude columns. When you click Continue, all existing invoices are displayed. Now you can open any existing invoice by clicking invoice number hyper link. There are two ways customer / vendor can be selected on an invoice (or order, quotation). If you have a large number of customers and/or vendors, it is more convenient to select customer by typing its number or name. To do so, goto Preferences and change Dropdown Limit to 0. 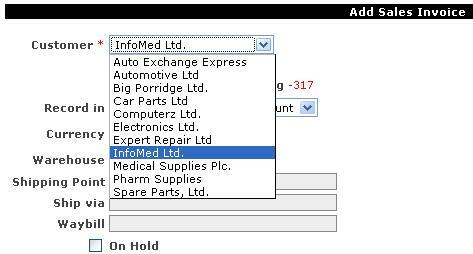 Now invoice form will allow you to enter customer number or part of customer name to select it. There are three possible ways you can lookup a part on an invoice, order or quotation. You can lookup a part by its number. If you enter partial number, all parts matching this number will be displayed. You can select the required part and click Continue to return back to invoice screen. You can enter complete or partial part description. If there are more than one part descriptions which match, these will be displayed. You can classify your transactions by specifying department, warehouse or project during transaction entry. More details on using these features can be found else where on this wiki. The important thing to note is that you need to define at lease one department, warehouse or project before the respective drop down list will appear on transaction forms. By defaults line items on invoices show most commonly used columns. If you want to enter more information against each line item, check the box next to Description heading on line items. Now when you enter an item code and update, you will see additional columns for delivery date, item notes, serial number, project, packaging, net weight, gross weight and volume.